What’s with the rise in popularity with cleaver knives? It just seemed like one day they were everywhere. 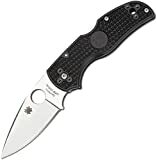 We had options from Spyderco, Boker, Kershaw, CRKT, and of course the Gerber FlatIron. The FlatIron made a big showing at SHOT, and it makes sense why. Gerber is a massive company, the FlatIron looked cool as hell, and Gerber promised a low price tag. Once the FlatIron hit the streets, they were tough to find, and in December I got my hands on one. For 31 bucks I didn’t have massive expectations, but I have plenty of budget knives that perform beyond their price tag. 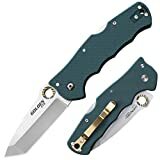 The Gerber FlatIron comes in two different grip styles, a hunter green aluminum grips and FDE colored G10 grips. The knife is a folder and pushes full size to its limits. 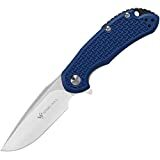 Gerber makes lots of knives at lots of different price points, some hit, some miss, but how does the FlatIron come out? The Gerber FlatIron gains its unique name from the flat, cleaver blade it has. The blade is 3.8 inches, with an overall length of 8.5 inches. It’s a big knife and weighs 5.6 ounces. That’s a bit heavy for a folding knife. As a cleaver the blade is quite broad, it sits at 1.125 inches wide and is .15 inches thick. It’s a big knife, and a cleaver has to be. Cleaver knives have become quite popular these days due to their robust blade design and just how thick they are. The cleaver blade is designed for cutting, slicing and chopping and the Gerber FlatIron has a very sturdy blade. The lack of a point is a downside to some and limits the knife’s versatility. The benefit is the knife less aggressive looking and lower profile in case that is a concern. In some situations, you may not want a point. I know a few first responders who carry Sheepshead blades to cut and slice near people while reducing the chance of stabbing someone if the knife slips. The blade is made from the always fun to type 7Cr17MoV steel. This is cheap steel, and the FlatIron is an affordable, Chinese produced, knife. It dulls relatively fast but sharpens easily. This is good because Gerber has dull blades when purchased. I’ve put it through my Smith’s Pocket Pal a time or two, and it edges right up. From what I’ve read this steel is pretty tough and resists corrosion well. Once sharpened it cuts well. My use for a cleaver has always been the kitchen, and the FlatIron separated meat from bone pretty easily. It cuts smooth and deep through meat and might make an excellent field kitchen knife. Additionally, as a cutting blade, it does excel when sharpened for cutting through tougher materials like thick cardboard, and plastic straps. The FlatIron was my go-to for opening Christmas present boxes for the kids this year. The blade has a worn, stonewashed finish that’s plenty attractive from a purely aesthetic standpoint. The whole knife looks cool, and that’s likely one of its most significant selling points. It’s like a straight razor that locks. The knife has a hollow grind, which isn’t a problem itself. However, the grind is very uneven. Looking down the tip of the blade shows a highly irregular and crude grind. The FlatIron sports an odd, but comfortable handle. One side features a grip panel, either aluminum or G10, and the other side is stonewashed aluminum that incorporates the frame lock and pocket clip. It’s a big handle that fills the hand which I do enjoy. The G10 grips provide more of a gripping surface, and the aluminum grips are smoother and better looking. The blade has a large choil that allows you to choke up on the knife for increased control and leverage for tougher cuts. It’s certainly deep enough to keep your finger from slipping out. The handle is also completely open. This makes it easy oil and clean. It is a small, but a nice feature I appreciate it living around sand and salt water. The rear of the blade has zero jimping which is odd. The pocket clip has a lot of good to it, but a bit of bad to go with it. First off, I like the short, but thick design. It’s low profile and also subtle. Best of all it doesn’t get in the way of your grip on the knife. It looks good too. It’s pretty tight though, and it’s difficult to get onto my jeans. Also, its right side, tip up only. You can’t reverse it in any way due to handle’s design. A bit of a downside in my book. The frame lock is simple, and in my experience, these locks are robust and handy. When you squeeze the grip, the lock is reinforced which means its a safe knife for hard work. Once opened the blade is locked in solid. There is no play left to right or back and forth. The frame lock is robust and does its job well with the big blade. The lock has a full inch of texturing where the thumb naturally falls, and this makes it easy to defeat the tight lock and fold the blade. The blade opens via a thumb hole. This design isn’t bad, but the blade is a bit tight when new. A little blade oil helped as did some use and now I can flick it open with ease. The blade will open smoothly, even when stiff. There is no grit or stop and go feeling as the knife opens. The thick blade makes the thumb hole easy to use. It’s a deep hole, so your thumb isn’t likely to slip out. The Gerber FlatIron’s greatest strength is its looks. It’s not particularly special outside of looking nice. You can’t demand much from a 30 dollar knife, but I’d expect at least an even hollow grind. I do see one solid purpose for this knife, and that would be for a younger, new knife owner. The blade lacks a point which reduces the risk for young and new knife users. The 7Cr17MoV steel is sturdy and corrosion resistant, so it can take the abuse, and since it dulls fast they’ll be learning to sharpen it, and it sharpens easily enough. The frame lock is very safe for heavy or clumsy work. While the knife can be flicked open it’s still slower than a Kershaw with speed assist or anything crazy. It’ll never be accidentally opened. The FlatIron is tough and robust so it will resist abuse. It’s affordable in case it is lost or broken. For people who are used to nice, high-end knives, the FlatIron might be a disappointment. I like the knife personally, but that’s because of my inner mall ninja. It doesn’t do one any one task well, but it is affordable, safe and tough. Editor: I recommend purchasing the Gerber Flatiron at Gerber Flatiron or BladeHQ. Please consider that buying anything through any of the links on this website helps support BladeReviews.com, and keeps the site going. As always, any and all support is greatly appreciated. Thank you very much. The Rhino is a large folder from Tecnocut’s Viper brand. Honoring its namesake, it features an oversized frame, robust build and armored appearance. Created by long time collaborator and custom knife maker Fabrizio Silvestrelli, it has flowing considered lines and a distinct appearance. The Rhino has an over-all length of 9.96”, a 4.25″ blade, weighs between 8.6 and 9.9 oz depending on the choice of scales, and is made in Italy. Don’t kid yourself, “Rhino” was not a misnomer. This is a big knife and is designed for those seeking something, well, built like a Rhinoceros. The blade has an unusual shape that sits in between a sheep’s foot and a harpoon pattern. At 4.25” and with a maximum width of 1.375” it offers a long cutting surface along with resistance against lateral stresses. The nature of the sloping spine also provides excellent tip strength. While a typical sheep’s foot blade is designed to avoid penetrating cuts, the combination of an elongated radius meeting a sloping belly results in an aggressive point. This is augmented by a swedge, improving the Rhino’s ability to perform thrust cuts. A dip after the nose-like tip adds visual interest as well as a practical place for your free hand for reinforced push cuts. The grind is a full flat with a secondary bevel. Because of the large width, the edge geometry is shallow, producing a fine edge despite the generous .157” stock. The steel used depends on the finish. Satin blades are stainless Böhler N690 while the charcoal blades are D2 achieving their corrosion resistance through the applied PVD coating. Both blade steels are good options and provide solid value for money. N690 in particular offers an excellent combination of stain resistance, ease of sharpening, and edge retention. D2 has a reputation for being more finicky, as it’s a tough semi-stainless steel that can be more challenging to sharpen, but it’s a good choice for harder use applications. The handle is substantial in both length and width. At 5.5” it will easily accommodate medium and large sized hands with or without gloves. The construction is closed with scaled, full stainless liners. You have your choice of carbon fiber or cocobolo handle scales. Designed for maximum retention, there are three distinct finger grooves that lock your hand in place. A slight flare on both sides of the inside edge prevent slipping in either direction. The back side is convex and nests in the palm comfortably. The back spacer is rounded adding style and avoiding hot spots while an adequately jimped thumb ramp provides extra control and feedback. Another run of aggressive, file-like jimping can be found on the lock release leaver for easy disengagement. Over-all the ergonomics are excellent. While several people don’t like finger groves I personally think they work well here. The grip is very secure. A full, natural feeling in hand is partly achieved by a palm swell equally .83” (21mm) at its apex. This could be somewhat of a downside when considering pocket carry as the knife tends to hog space. Even though the clip is deep riding, the ornate appearance along with the handles bulge might generate some unwanted attention. Is that a Rhino in your pocket….? As an additional carry option there is a recessed lanyard slot in the pommel. I’m a fan of these as it keeps everything clean looking and orients your lanyard in a sensible direction. It would be nice if Viper also included a MOLLE compatible belt sheath. I could see a folder this size benefiting from the ability to carry it on a bag, vest or belt straight out of the box. Deployment is achieved via ambidextrous thumb studs. Phosphor Bronze washers and a finely dialed in spring tension make opening very fluid and easy. The thumb studs are large and easy to access. One downside is that the pivot is not adjustable unless you remove the handle scales. That said, I have not needed to adjust the pivot on this knife. Back locking knives aren’t often associated with smooth operation however Viper has, on a number of models, achieved a perfect balance between ease of use and a reliable, tough play free lock-up. The lock is easy to disengage when you are ready to close the knife. Blade centering is perfect on these knives. Everything considered the Rhino is an unusual yet attractive knife. Unapologetically oversized, it will probably appeal to a very niche market of collectors and users. If massive appeals to you, it will surely impress in the over all fit, finish and value. With a maximum price of $200.00 for the the PVD D2 and Carbon fiber model, you are getting a ton of premium materials and craftsmanship for your money. I could easily see this knife in any collection, in the bag of an outdoorsman or on the vest of a serviceman. 7Regardless of its quirks it is undeniable that the Rhino is extremely well made and functional. It’s also great that Viper, as with many of their other models, offer the Rhino in a variety of handle and blade materials accommodating a variety of tastes. To further this, it might be good for the company to consider a scaled down version as an EDC for a wider audience. Editor: I recommend purchasing the Viper Rhino at BladeHQ. Please consider that buying anything through any of the links on this website (including Amazon) helps support BladeReviews.com, and keeps the site going. As always, any and all support is greatly appreciated. Thank you very much.